I've made a set of cards and worked with a simple technique for the background. I layered colors of paint on top of each other using my gel printing plate. For this project I've chosen an older Squiggly Ink stamp set, one from the Flora and Fauna series. Love the shape of the stamps, it's a very versatile set. 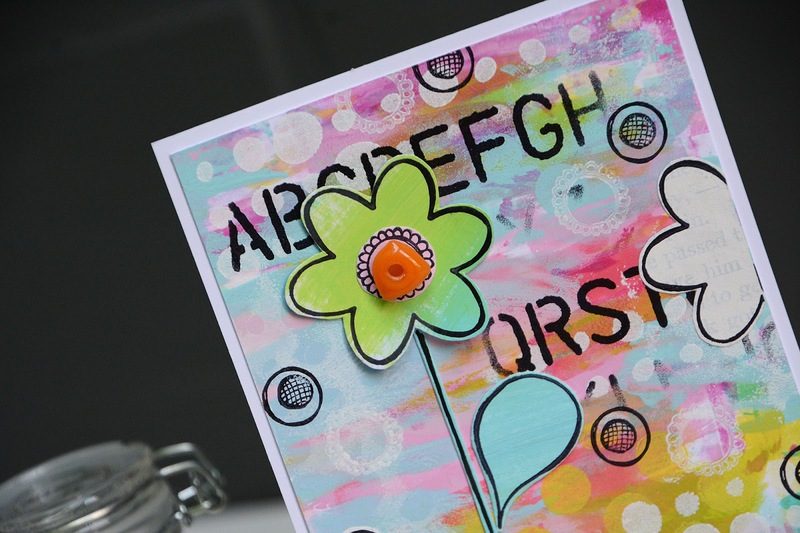 At the end I'll demonstrate a few possibilities to add beads on cards. 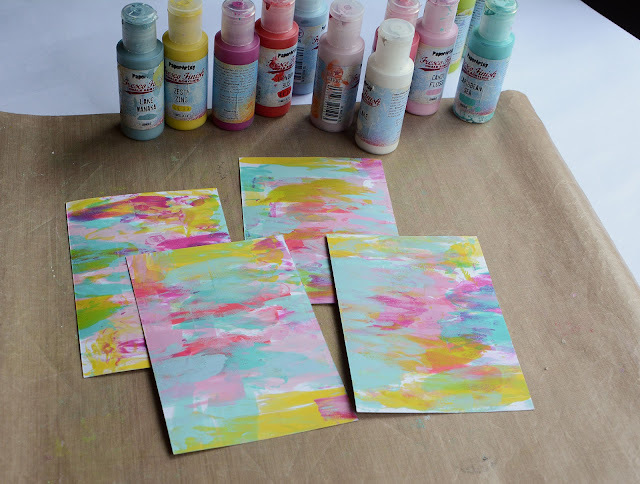 I worked with my 15 x 15 cm gel printing plate and Fresco Finish Chalk Acrylics Zesty Zing, Limelight, Caribbean Sea, Mermaid, Lake Wanaka, Ice Blue, Pixie Dust, Candy Floss, London Bus, Prawn and Bougainvillea. I've cut 4 cards from a sheet of PaperArtsy Smoothy 340grs cardstock. 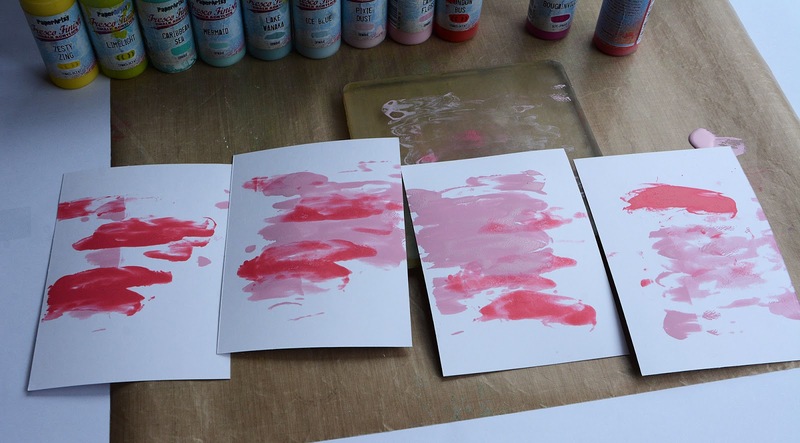 I started by spreading a small amount of Candy Floss randomly to the gel printing plate with my fingers. I made a monoprint on each card. Next I repeated this step with Prawn. I changed back and fort with the order of the cards while printing so each card received the same amount of paint during the printing process. I continued printing, one color at a time. By using this technique the colors are sitting on top of each other, they do not blend together. So there is no chance to end up with muddy colors. It's a simple technique I learned from Kate Crane. Not a lot of thinking involved, just playing! 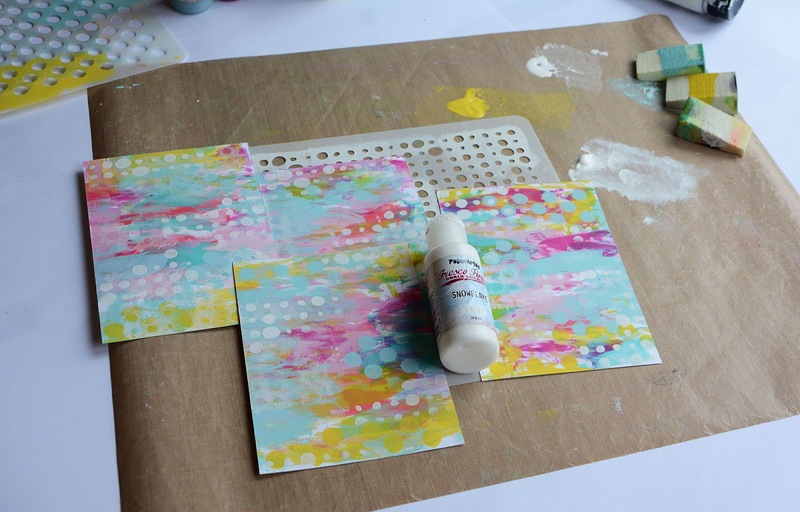 After the monoprinting was finished I added dots by applying Mermaid and Zesty Zing through a stencil (Donna Downey Signature stencil 'Halftone Dots'). I created white dots using Snowflake and a the Donna Downey Signature Stencil 'Grunge Halftone Dots'. I added black accents using Archival Ink Jet Black and a stencil (Donna Downey Signature Stencil 'Mini Alpha Rerun'). I stamped flowers, flower centres and leaves from the Squiggly Ink Flora and Fauna 5 set on scraps of painted paper with Archival Ink Jet Black and cut out. On each card I put together a flower, used a strip of painted paper as a stem. 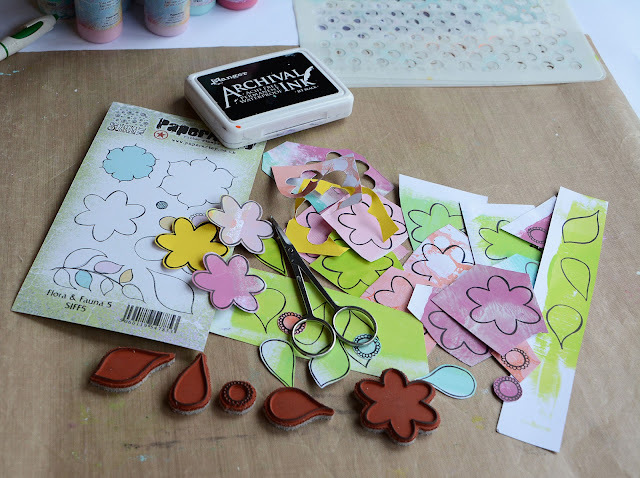 I stamped the same flower on gesso-ed vintage booktext as well, used these prints to further decorate the cards. 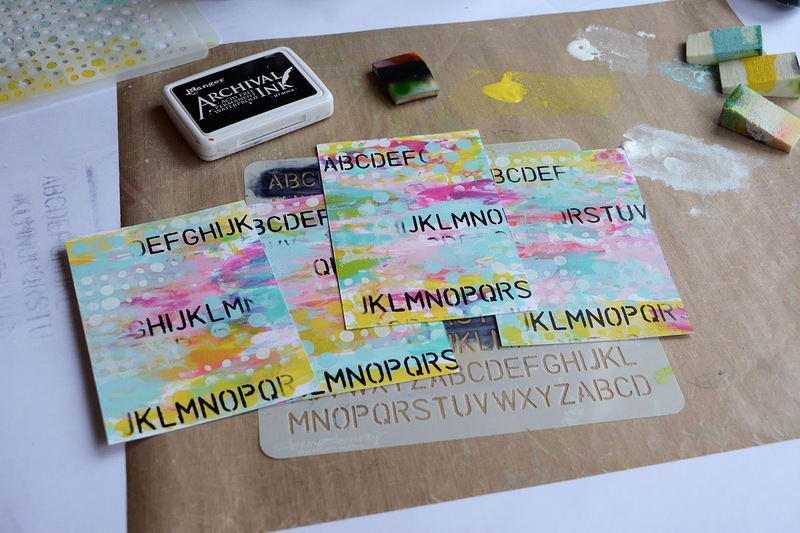 I used the small stamps from the set to do some background stamping. I decorated two of the cards with a row of dangling beads on a cord. With my We R Memory Keepers Crop A Dile I set an eyelet on which I knotted the cord. 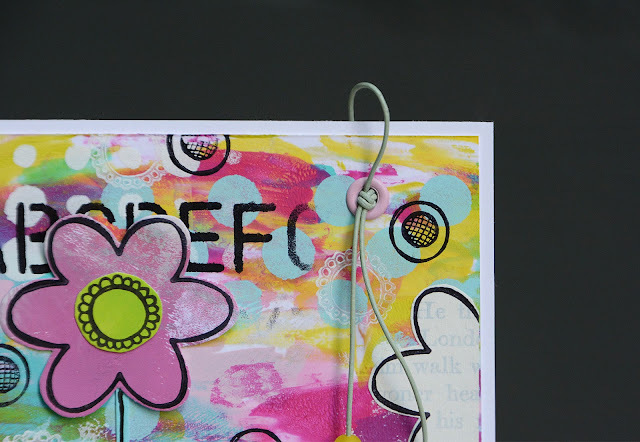 On this card I attached a strip of painted tissue paper to the bottom of the card using mini staples. I decorated the card with beads, charms and cord as shown. I make sure to only use small beads on my cards. Here I glued small beads in matching colors to the bottom of the card. I added an orange one to the flower centre as well. 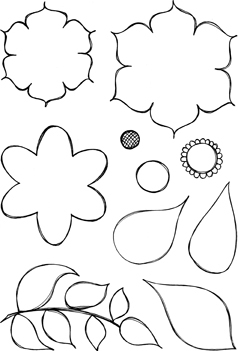 I generaly attach beads with micro glue dots or with a very small amount of Tacky Glue. I'm sure you have lots of beads and charms in your stash as well. Go get them, give it a try and join the challenge. It would be lovely to see what you come up with! 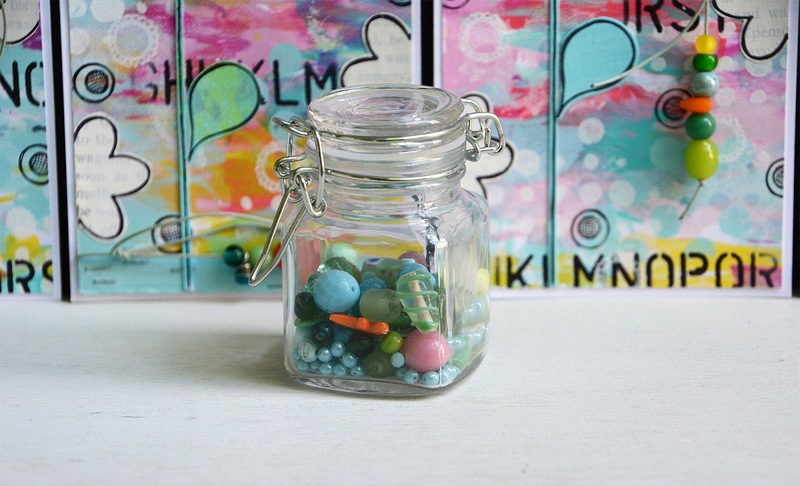 Great backgrounds, and fab cards using up your stash of buttons and beads, love them. What gorgeous cards Anneke! I love the bright colours and pretty coloured beads are the perfect embellishment. 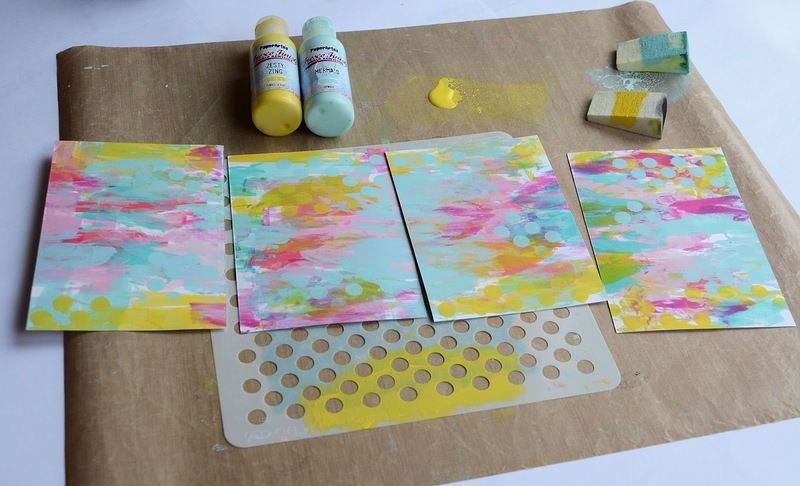 Must have a go at that simple Gelli technique too....looks real fun! I immediately recognized your style Anneke, beautiful cards! What a lovely colours cards and pretty dangled beads.